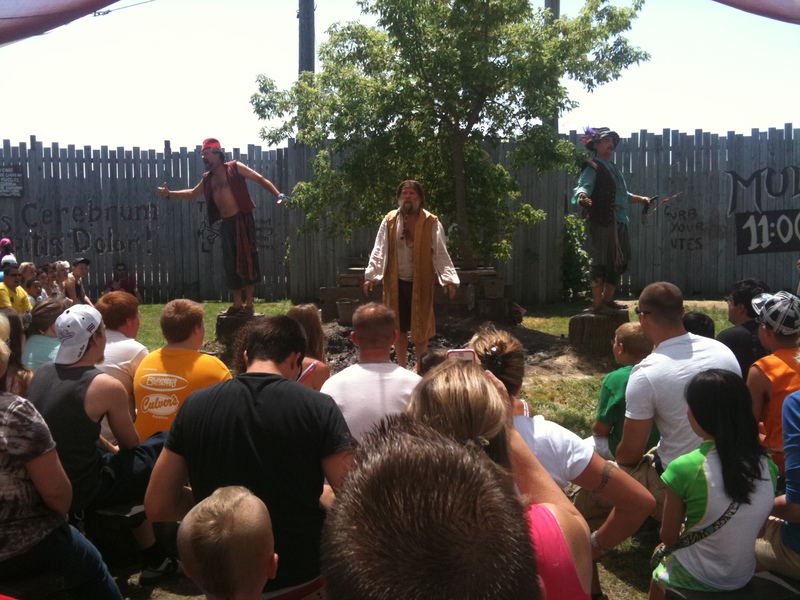 The Practical Theatre Co | Paul's Voyage of Discovery & Etc. Bringing Practical Radio Theatre to Life. 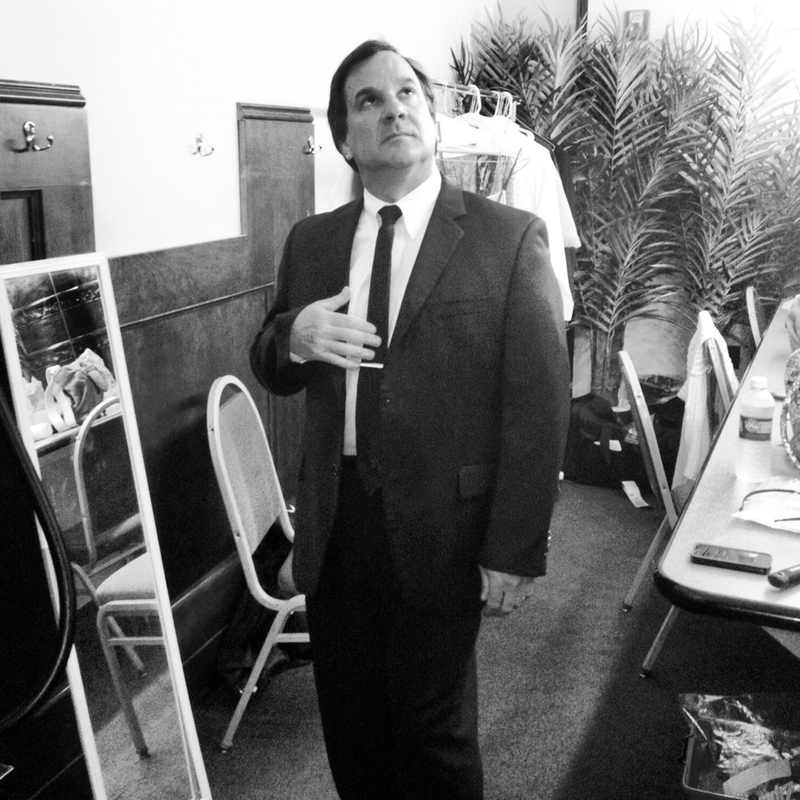 It was the first time I performed in a comedy revue while wearing a bowtie. I wore a faux bowtie t-shirt under my jacket for “Goodtimes” — my first-ever comedy revue in Cleveland in 1975. That’s me on the far right. I was still in high school. 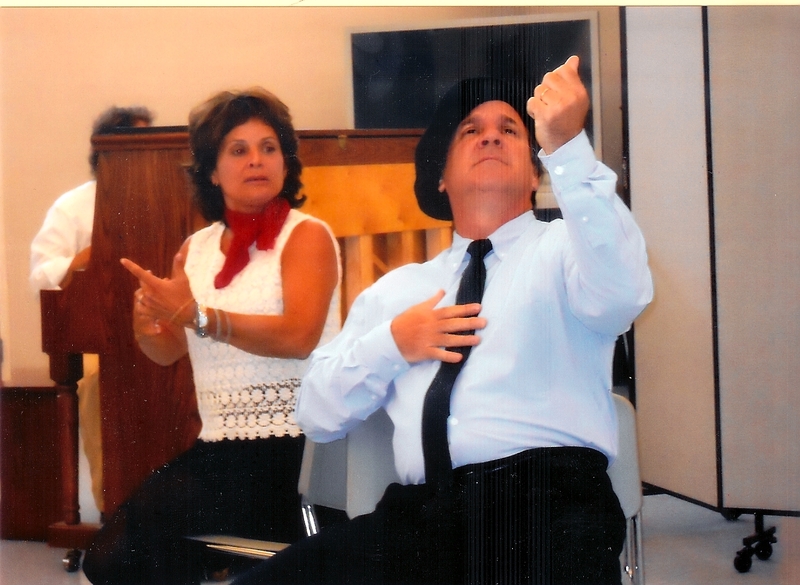 (In fact, my high school drama director, Mary Ann Zampino, is seated above me.) But, 43 years later, the bowtie was real. At the suggestion of our musical director Steve Rashid, in cahoots with Chicago FM jazz station WDCB, we took up the creative challenge of adapting what we’ve been doing in our popular holiday shows for an audience of radio listeners. 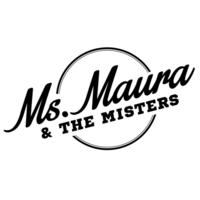 First — we scheduled shows on December 28 and 29, 2018 at Studio5 in Evanston, Illinois. Then, two months before those curtains were scheduled to go up, Victoria Zielinski, Dana Olsen and I began the process of becoming The Practical Radio Theatre Company of the Air. The Practical Theatre has played a lot with comedy revue formats since our first improvisational comedy revue back in 1980 — but this was the first time we were having fun with the radio show format. To begin the process, we focused on sorting through which of the sketches and songs in our repertoire would work best on the radio. Most PTC sketches feature a lot of words (some might say too many) — and the material we developed for The Vic & Paul Show and The Vic & Paul & Dana Show is particularly loquacious. So, that was good. Certain beats needed some tweaking, especially topical jokes that had to be updated, but it was creatively stimulating to take a fresh look at some of our favorite sketches. One of the happiest re-discoveries was the revival of the “Marine Comedy” sketch, which made its summer of 1980 debut in the running order of Bag O’ Fun– the PTC’s first improv comedy revue. I play a boot camp drill sergeant leading a group of comedian cadets through their comic paces. The call and response of a veteran DI grilling his green troops lent itself well to radio. But keeping in mind that the live cabaret patrons aren’t the primary audience we must serve — how do you simulate a pratfall for the radio? Questions like that lead to the biggest revelation in our writing and rehearsal process: the sound effects. Of course, we agreed right away that we wanted to employ traditional hand-made radio show sound effects: the kind we remembered so fondly from the classic radio shows of the 1930’s and 40’s. (And no, we’re not thatold.) My dad, who was born in 1927, introduced me at an early age to the classic radio shows of his youth: classics like “Fred Allen’s Alley” and “Fibber McGee and Molly.” Fibber McGee’s closet – the quintessential old time radio sound effect – would not have been as famously funny in any other medium. With about a month to go before opening night, we began to develop some sketches specifically for radio, including two episodes of “Fred Knoblock: Secret President” — a retro radio mystery about a former Walmart greeter pressed into service as a body double for a thinly disguised Mango Mussolini. For the past few years, we’ve normally featured a corps of dancers in our revues – and Victoria insisted that we include a dance number in the show. But how do you perform dance on the radio? Dana came up with a script that evolved into one of the show’s freshest and funniest sketches — in which Daniel and his brother (also a drummer) put thimbles on all their fingers and became a tap dancing troupe breaking out show-stopping moves. It became the sound effects highlight of the show. As occupied as we were with the creation and execution of all the sound effects, another vital radio show element never troubled me: the music. That’s because maestro Steve Rashid was in charge, and the band he assembled was first class. Among the musical wonders Steve performed were the composition of theme music for the show, Practical Radio Theatre On The Air, and all the shows within the show, including “Middle Aged Jeopardy”, “Fred Knoblock: Secret President” and “This Old Man”. We also brought in two more musical ringers: vocalists Paul Marinaro and Eva B. Ross. Paul is a Chicago jazz favorite with a rich, dynamic voice that makes the Great American Songbook come alive. Eva is an up and coming singer-songwriter who shares Steve and Paul’s passion for jazz. Whether singing solo or in duet, Paul and Eva gave us two more musical aces in the hole. 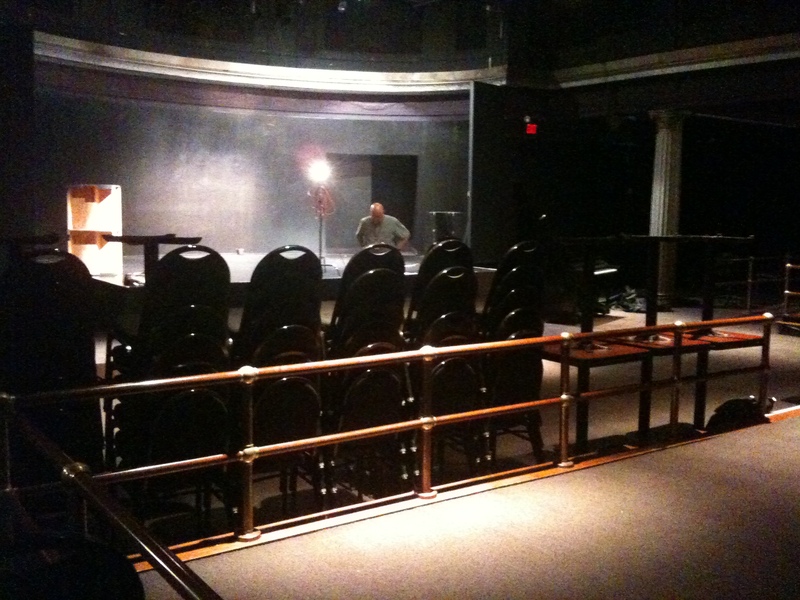 So, on the day after Christmas 2018, we returned to the familiar cabaret confines of Studio5 to prepare for a presentation that was not at all familiar to us. 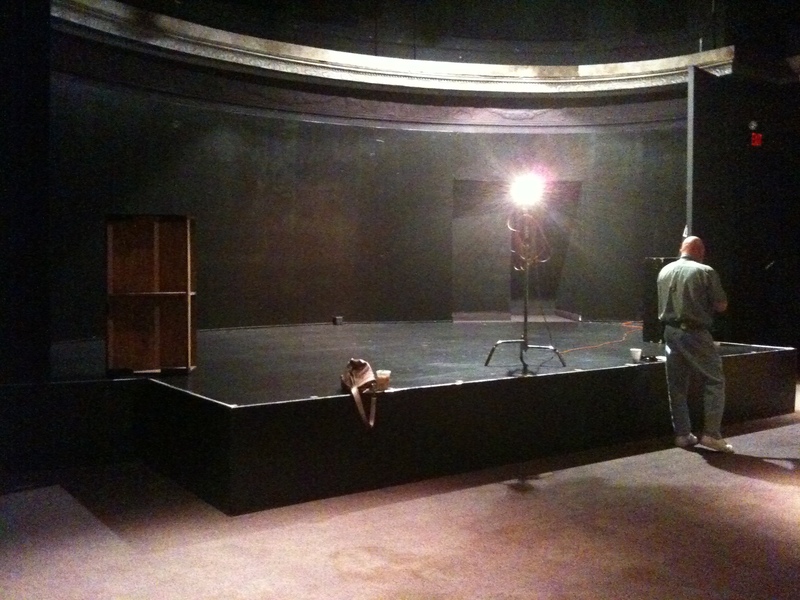 We had just two days to set up the sound and lighting and stage the material we’d developed over the previous two months. Luckily for us, we had audio master Sam Fishkin handling the complex task of not only making sure that the cabaret audience could hear everything – but recording it all for the radio, too. And making the lighting of the show seem effortless, as usual, was Charlotte Rathke. It’s a joy to work with two pros that do beautiful work and never miss a cue– especially when so much of what you’re about to do onstage is new for everyone involved. Early on the first day in Studio5. Don Stiernberg practices on guitar while Steve Rashid steadies the ladder for Sam Fishkin, who is hanging microphones. Robert Rashid and Eva B. Ross hang out in the audience while Victoria Zielinski practices her lines in from of Daniel Rashid’s sound effects tables. Some critical sound effects props. Note the horn and siren whistle. Vic and Dana and I used these two items to censor our profane words in real time. The damn horns could be really funny — but often misbehaved. The siren whistles were more dependable fun. Get one for yourself and see! Early rehearsal on the second day. You’ll note that Charlotte’s lighting plan is underway. With our backs to her work most of the time, we had no idea what Charlotte achieved until we saw the photos later. It was a very pleasant surprise too see how good she made everything look. Another view of rehearsal. Sam (at left) listens as Dana, Victoria and I work our way from sketch to sketch, while Charlotte (who can be seen way back in the upper right) dials in the visual splendors of her lighting plot. Steve goes through his script during rehearsal. He had a ton of music cues, a band to lead, two guest vocalists to work with, his own songs to perform — and very little time. Daniel Rashid and his lovely assistant, Eva B. Ross, work on the sound effects for “This Old Man” — firing up a circular saw and a belt sander. Kids, don’t try this one at home! Dress rehearsal in the hours before opening night. See? I’m wearing a bowtie! Another pre-opening moment — this time with a glimpse of Jim Cox playing the upright bass (upper left) which is just about the coolest instrument that exists. Note the upside-down bicycle (at right). The bike was used to simulate the motorcycle Dana rode onstage. How? A very old trick: baseball cards in the spokes. 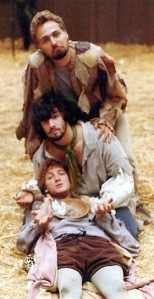 The cast gathers just before going onstage for the first show. Paul Marinaro (bottom left) is taking the selfie — and why not? The dude’s way more than 6-feet tall! He sounds even taller when he sings. A shot from the house as the audience begins taking their seats for opening night. In the background, Daniel and Eva go over some last-minute sound effects notes. You can tell by the audience in the foreground that the first show is underway. 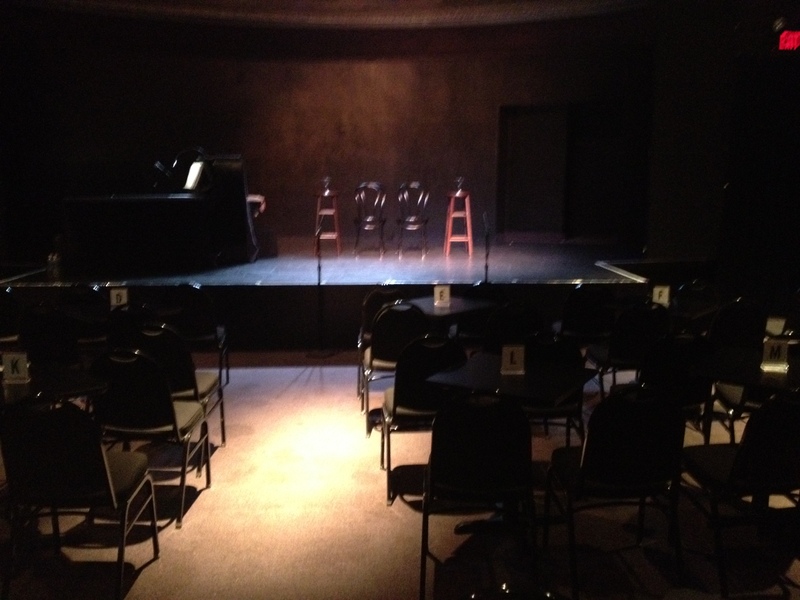 We enjoyed two sold-out, overflow shows in the 150-seat Studio5 cabaret theatre. Radio shows work best with a lively, smart and enthusiastic live audience. Our audiences were all of that and more on both nights. A view of opening night from the wings. I like these black and white pics (shot by Paul Marinaro) because they look like they might have been taken in the 1950s or early 60s. 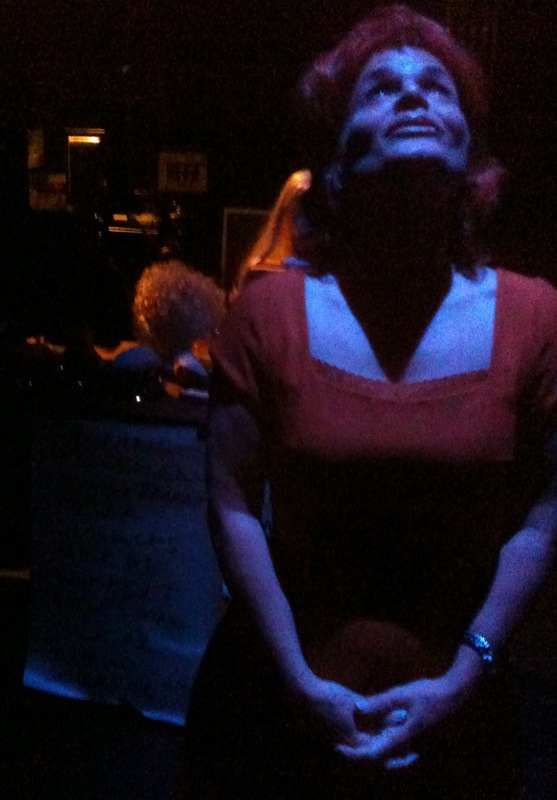 Guest vocalist Eva B. Ross performs on opening night. Daniel and Eva, his lovely assistant, perform sound effects for “This Old Man”. Eva runs the belt sander to approximate the sound of an electric generator — as Daniel blows bubbles to indicate a pump at work. Maestro Steve Rashid in control at the grand piano. Note the socks. Steve is clearly a jazz guy. Eva B. Ross and Dana perform “Baby It’s Cold Outside” — with Dana singing in Norwegian. Cast and crew photo at load out on the day after the second show. 3 Weeks until Big New Year’s Fun! There are now just three weeks left to reserve your seats for Mr. Olsen’s Champagne Celebration at Studio5 in Evanston. Tickets are going fast for the funniest and most fun New Year’s party on Chicago’s North Shore. Following last year’s smash holiday engagement at Studio5, the legendary Practical Theatre returns with another entertaining comedy and music revue featuring veteran improvisational comedy writer-performers Victoria Zielinski, Paul Barrosse and Dana Olsen – Joined by the PTC’s musical director, Steve Rashid, songbird Eva B. Ross, standup comic Emilia Barrosse, Giggle Break’s own Daniel Rashid, cabaret chanteuse Shelly Goldstein — and the Studio5 All-Star Band, featuring Rockin’ Ronny Crawford on drums, Don Stille on accordion, bassist Joe Policastro, and Don Stiernberg on every stringed instrument a man can possibly play. Plus percussionist Robert Rashid. All this — and The Mr. Olsen Dancers! Only 3 shows: Friday December 29, Saturday December 30 and Sunday December 31. Tickets are on sale here! There will be a cash bar for all three shows. Doors open for cocktails at 7:30. And there’s plenty of free parking right in front of the theatre. Don’t miss the biggest party of the year! 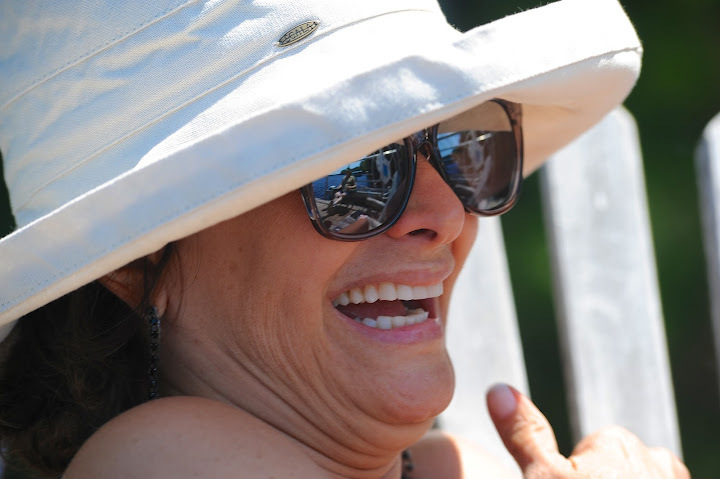 Ring in the New Year with Laughter! There are now just five weeks left to reserve your seats for Mr. Olsen’s Champagne Celebration at Studio5 in Evanston. Tickets are going fast for the funniest and most fun New Year’s party on Chicago’s North Shore. The Fun Begins This Friday! In late June 2012, I had just completed the first of three stages in my two-month summer sabbatical from the television business. 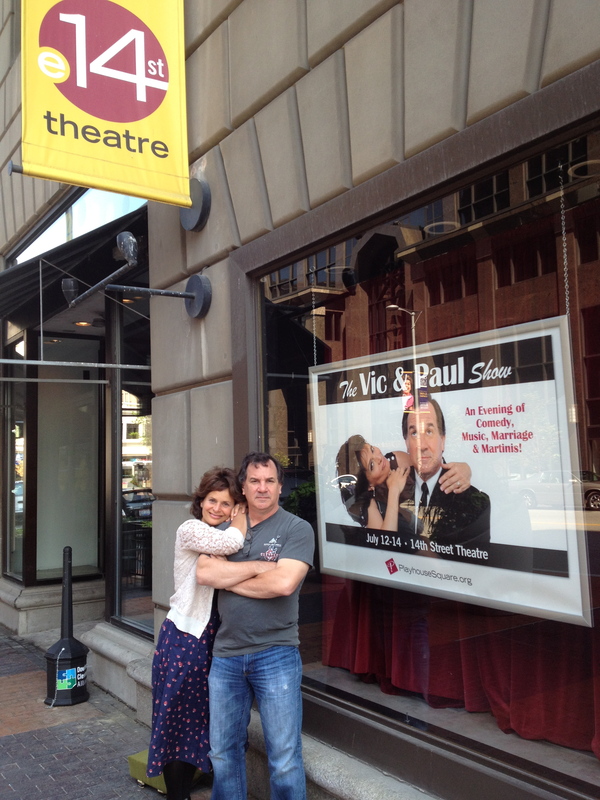 It was a dramatic step to jump off the TV treadmill after 22 years and reconnect with my improvisational comedy roots – but while our run of The Vic & Paul Show at The Beverly Arts Center on the South Side of Chicago started out well, it wasn’t exactly a blockbuster engagement. We had some good shows, in particular a fine opening night and a rousing Father’s Day matinee where the audience got every joke. On those nights my wife Victoria, our musical partner Steve Rashid and I were greeted with the familiar sound of knowing laughter after every sketch. But there were too many shows where the laughs – and the ticket buyers — were scarce. 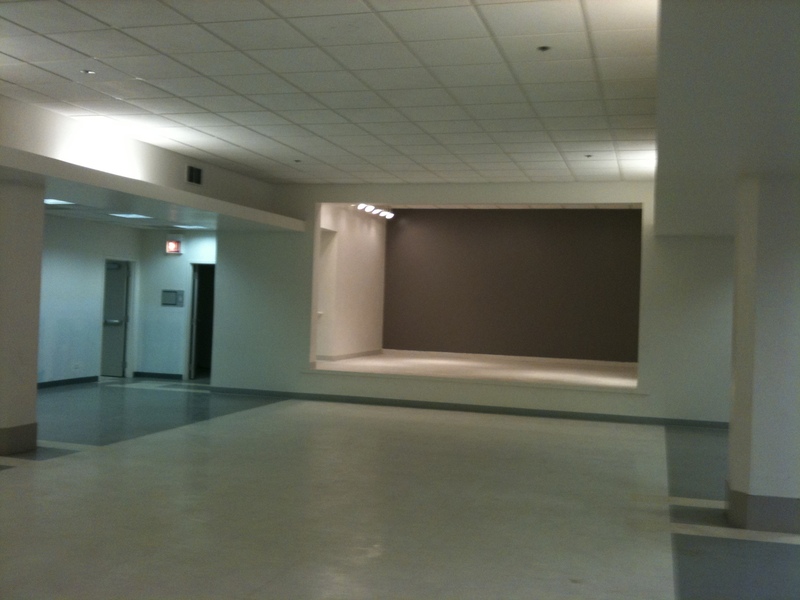 We closed our run at The Beverly Arts Center with fond memories of our large, appreciative North Side audiences at Mayne Stage in Rogers Park six months earlier. The highlight of our Beverly Arts Center experience were the visits from good friends who traveled many miles to see the show and share some laughs with us: the brilliant pianist and composer Larry Schanker and his wife Jenny, our great friend Bubba George McClellan who made the long drive in from Fort Wayne, and my Rockme Foundation band mates Casey Fox and Rush Pearson, who brightened the BAC scene with their better halves. Our hosts, Steve Stroud and Carol Stogsdill were waiting for us at Steve’s charming family cottage with their characteristic hospitality, a fridge full of cold Leinenkugels, and another couple of our very best friends, Jim Newton and Karlene Goller, along with their teenage son Jack and a school pal, Chris Gates. 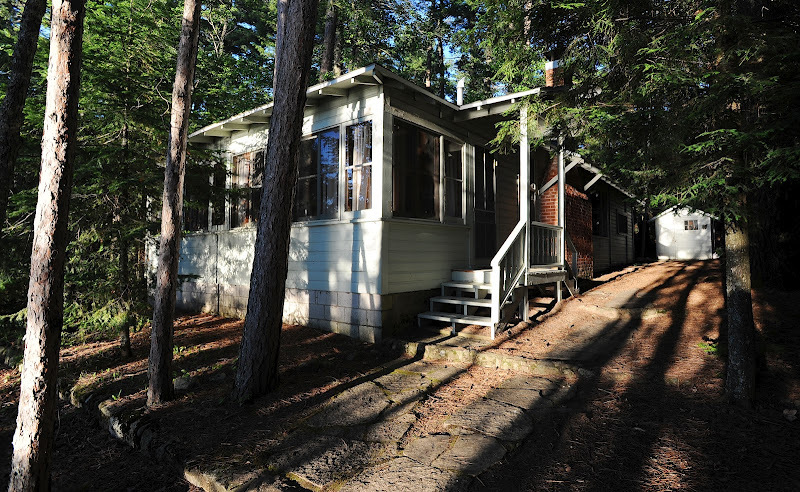 In this delightful company, amid the natural beauty of Three Lakes, we settled in for a wonderful week at Camp Stroud. Campers have got to be active at Camp Stroud. 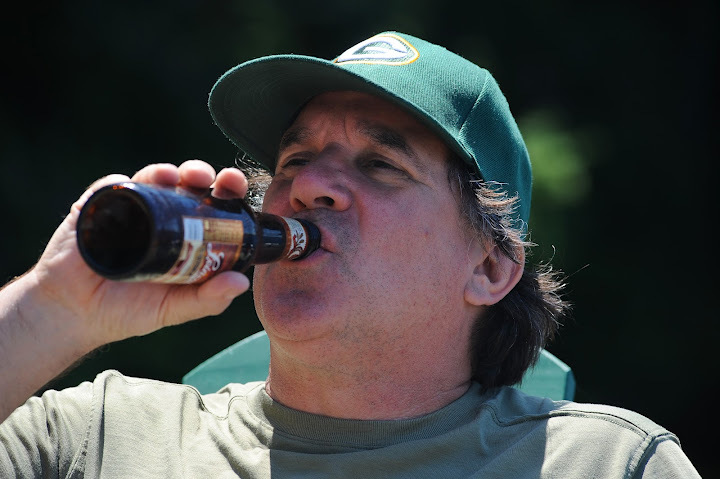 Not that there isn’t plenty of opportunity to sleep a bit late and pass some time sitting lazily on the dock sipping a Leinenkugel Summer Shandy. Indeed, such indulgences are required. But camp counselor Stroud is an avid proponent of aquatic sports of all kinds, and it was made known that if Victoria and I wanted to earn our Camp Stroud merit badge, we would need to take advantage of the kayak, canoe, paddleboard, and sailboat that stood ready for our use. 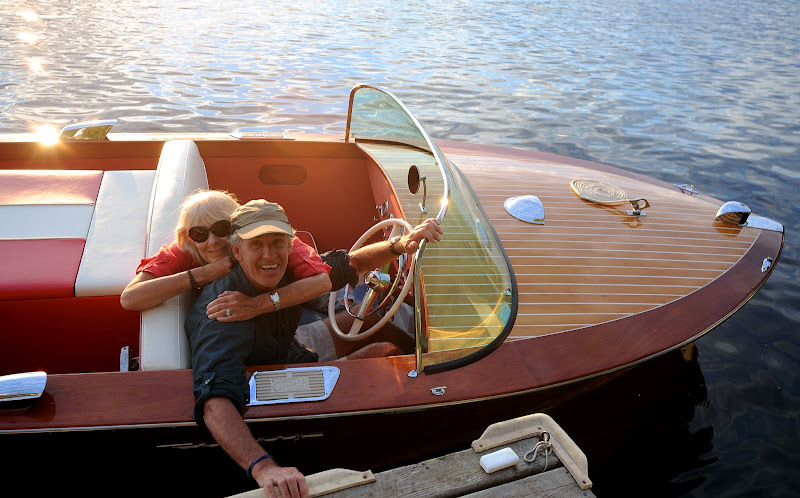 Steve also had his family’s sleek, gorgeous, classic powerboat in the boathouse – and as the sun set on our first day at Three Lakes, we motored out across the lake to take in the sights and sounds of summer in northern Wisconsin. That night, I was given the honor of fashioning a formal campfire service to retire the old, tattered U.S. flag that had long served as the ensign for Steve’s powerboat, waving proudly from its stern for many years. With Jack and Chris assisting me, we disposed of Old Glory in the regulation manner, consigning it to the flames with all appropriate honor and solemnity. 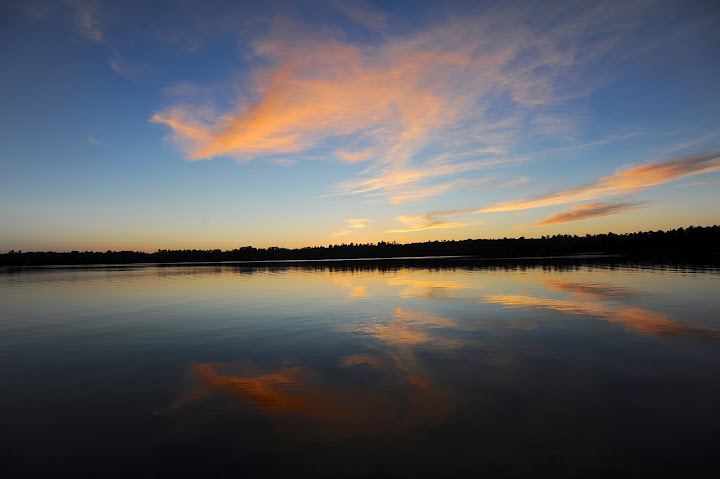 Among the highlights of our week at Camp Stroud was a pontoon boat trip that Captain Stroud piloted across several of the interconnected lakes in the Three Lakes area. At one point, it was necessary to maneuver over a dam – which required putting our craft on a boatlift that carried it over the dam and lowered it back into the river below the dam. I’m a big fan of nautical evolutions, and this one was new to me. But the coolest moment on the pontoon boat trip was witnessing a white-headed sea eagle (commonly called a bald eagle) catch a fish. 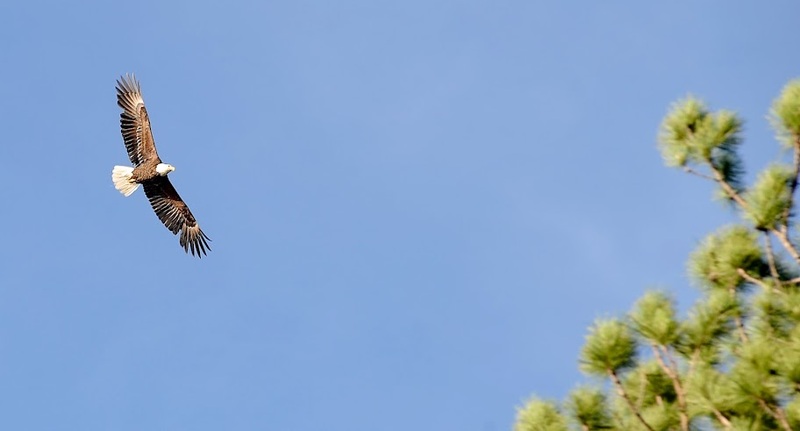 As we made our way back to Steve’s dock, I was watching an eagle soaring above the lake not far from our boat, just as I’d watched dozens of eagles circling in the sky in the past three days. But this time, the eagle dove down toward the water – not more than ten yards off the port side of our boat. 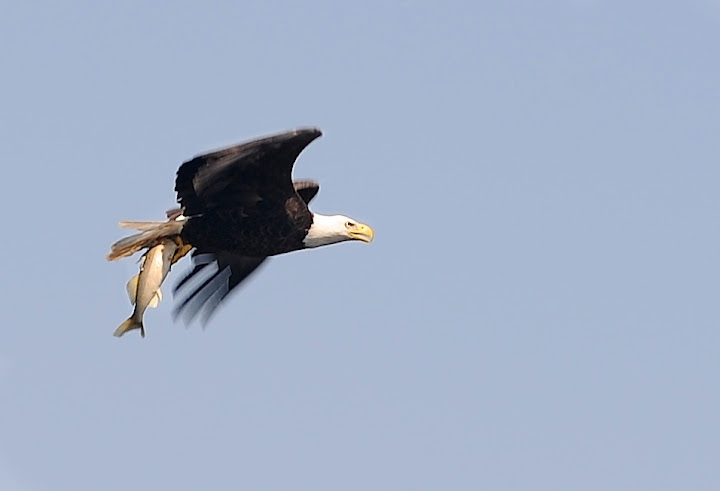 There was just enough time to alert the rest of our party – and we all watched in awe as the eagle stretched out its talons, plunged them into the water, and snatched a large fish! 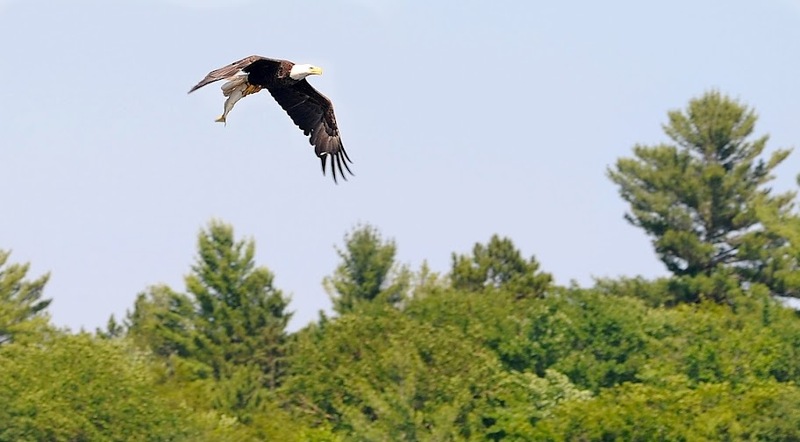 Steve, a professional photographer and photo editor at the LA Times, got his camera focused in time to record the event – and shot a series of photos as the eagle raced across the lake clutching its prey, and soared off into the trees beyond Steve’s cottage. If nothing else had happened the whole trip, that moment alone would have been worth the long drive to northern Wisconsin. For the rest of the week, Victoria and I worked on earning our Camp Stroud merit badge, although it must be said that my darling wife proved far more proficient on the paddleboard than I did. In fact, I stunk at paddleboarding. I was much better in the canoe and kayak. But I was lucky to barely earn a qualifying grade in the small boat sailing portion of my requirements. Salty, capable Steve took me out in the smallest sailboat I’ve ever been aboard – and though I managed to help keep her afloat, I cannot say that I covered myself with anything resembling glory on that brief voyage. Still, it was great fun – as was our entire week at Camp Stroud. On the morning of our final day in Three Lakes, Steve gave Victoria and me our final Camp Stroud challenge: to join him in his annual swim back and forth across the lake. 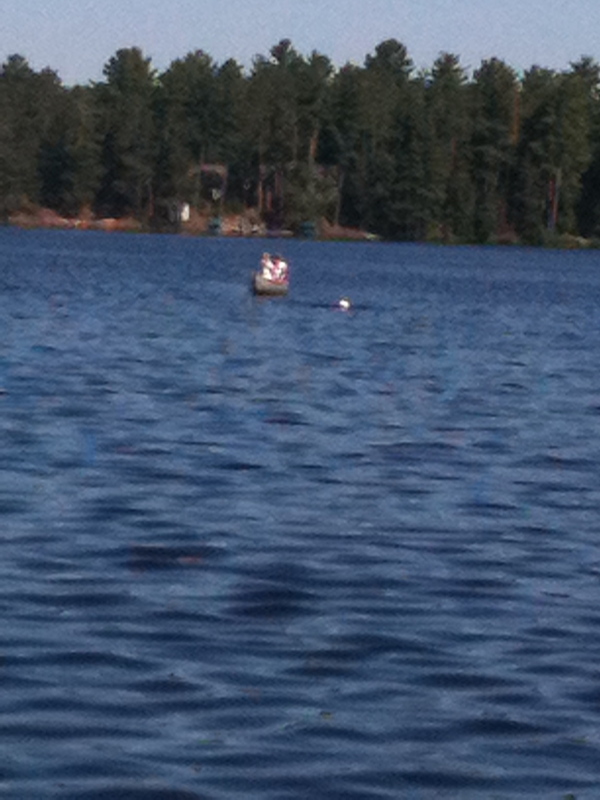 That little white dot is Steve, halfway across the lake. To my surprise, Victoria jumped at the chance to make what looked like a more than mile-long swim in chilly waters from Steve’s dock to the other side of the lake and back. I’ve never claimed to be much of a swimmer, so I begged off – even though it my might cost me my merit badge. 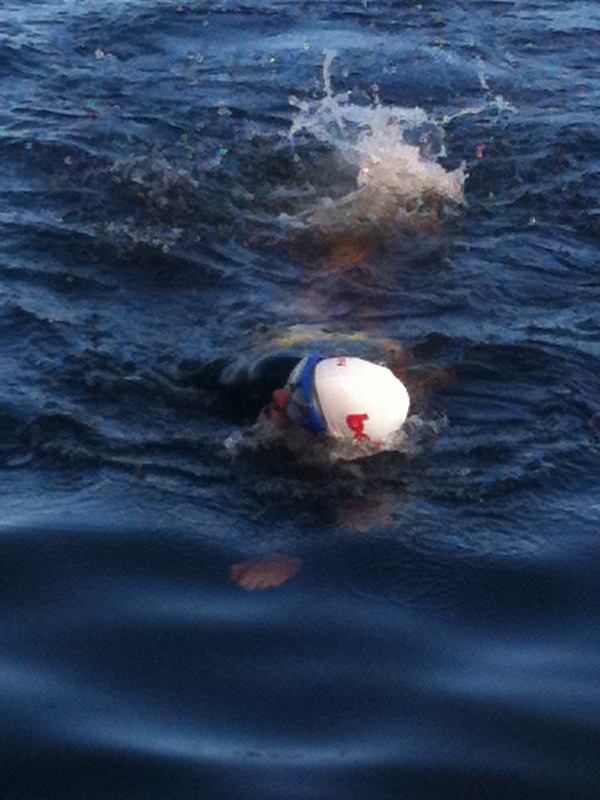 Victoria was game – and she began her marathon swim with great determination. She got about a quarter of the way across the lake when common sense and self-preservation prevailed — and she gave up her attempt. 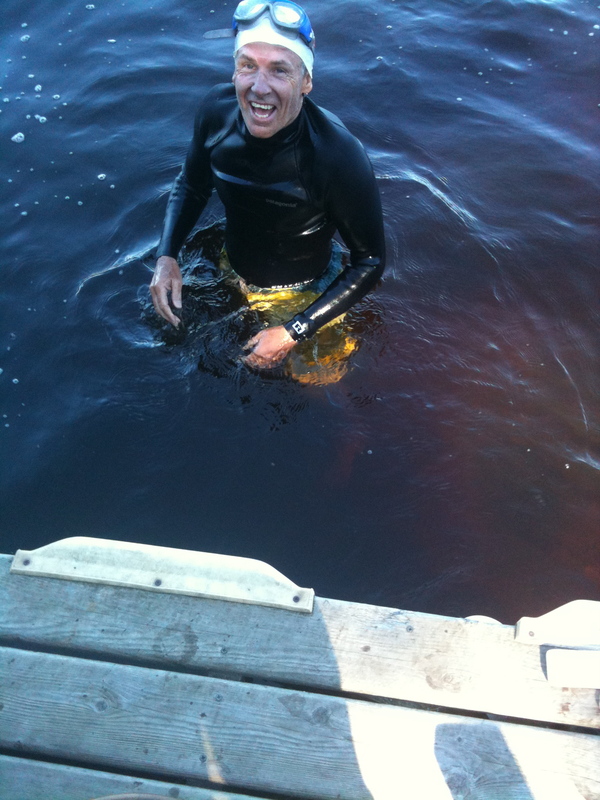 Steve, however, swam on and on and on like an English Channel swimmer – and made it back to his dock with a wide, victorious smile. It was an amazing feat. 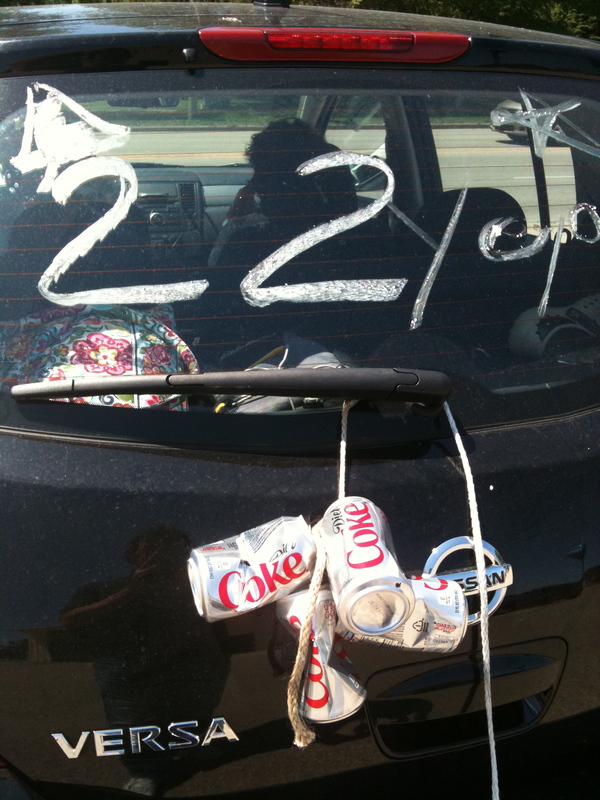 As we departed Camp Stroud, our camp mates surprised us by decorating our car with a Diet Coke can tail – and a soapy sign on the rear window celebrating the fact that it was our 22nd wedding anniversary. In fact, we’d almost forgotten our anniversary. Victoria and I had gotten entirely off the grid of our normal existence this summer, and with all the plans, travel, and performances that crowded our calendar, we were blissfully unaware that June 30th was anything more than the date on which we planned to drive back to Chicago. 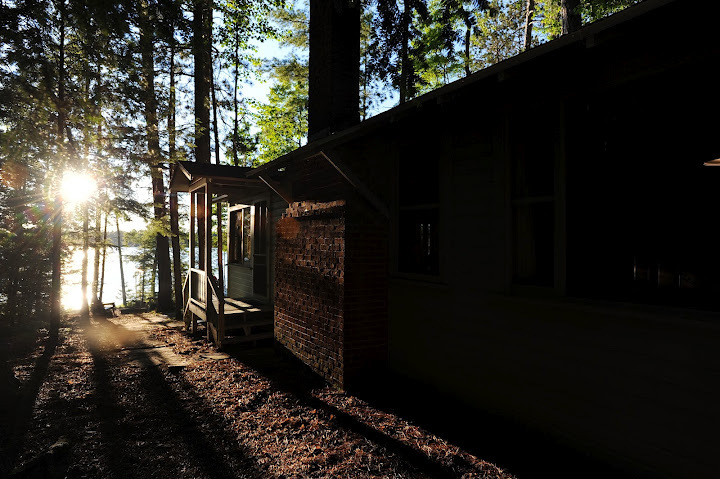 That changed when Vic and I decided not to drive all the way back to Chicago in one day – but to break the trip up with a romantic one-night stay somewhere halfway between Three Lakes and Chicago. 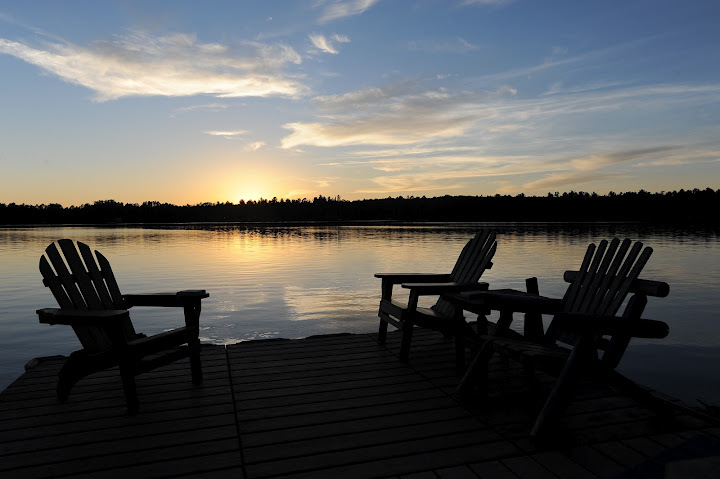 Steve and Carol recommended a resort in Kohler, Wisconsin, north of Milwaukee. When Victoria called to book a room the woman taking the reservation asked if we were celebrating any special event. Thank goodness I was sitting right next to my darling wife when she made that call. I was looking right at her as her eyes widened and she came to the sudden realization that – yes, indeed – we were celebrating a special event. It was our wedding anniversary! We had BOTH forgotten it. I shudder to think of the calamity had I been the only one that forgot. 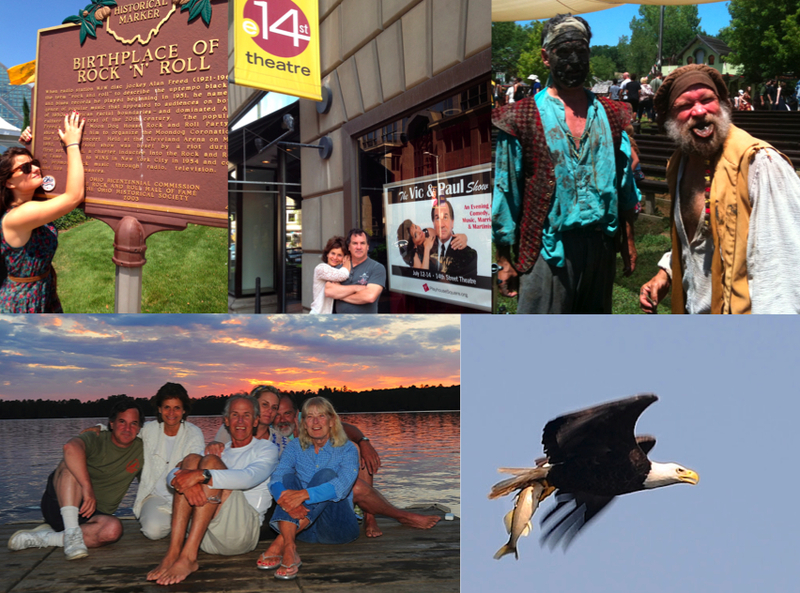 We got back to Evanston on July 1st, just in time for me to board a plane for a quick one-day trip to Cleveland to scout The 14th Street Theatre in advance of our upcoming run. 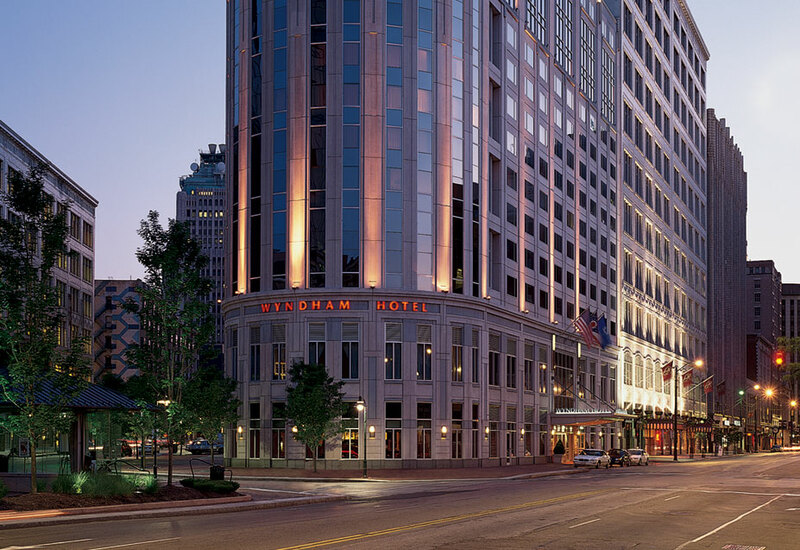 I arrived in Cleveland late that night and slept at my mom’s house before heading downtown to Playhouse Square the next morning to check out the space where we were set to open “The Vic & Paul Show” in a dozen days. The thought of having a cabaret of my own was not a random one. In fact, the other underlying reason for my sabbatical was to explore the notion of opening a comedy cabaret on the North Shore of Chicago, preferably in Evanston. So, when I returned from Cleveland, that exploration got underway in earnest. Downstairs in the Marshall Fields building. During the course of the next week, Victoria and I had a series of meetings with area restaurateurs and people from the Downtown Evanston development organization and city of Evanston. Joined by the very funny Dana Olsen we took a tour of possible cabaret spaces with Carolyn Dellutri, Executive Director of Downtown Evanston. It’s been 32 years since we opened our own comedy shop on Howard Street in Evanston – and the idea of having our own home to perform in again is a compelling one. I would spend a lot of time over the next month and a half in Chicago meeting with people whose opinions I respect, confessing my plans to them, and getting their feedback. On Sunday, July 8th, the day before we left for Cleveland, Vic and I drove to the Illinois-Wisconsin border to see The Sturdy Beggars perform The Mud Show at The Bristol Renaissance Faire. 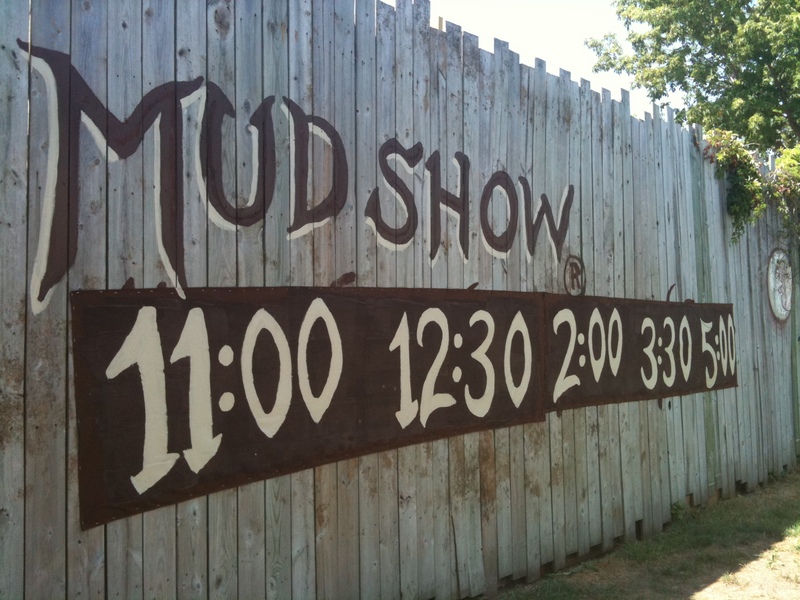 It’s been many, many years since Victoria and I cavorted in the mud as Sturdy Beggars, and we were delighted to be back at the mud pit to watch our good friends Rush Pearson, Herb Metzler and John Goodrich perform “The Greatest Show In Earth”. This was another homecoming for me. Herb was with me (along with Jamie Baron) in the summer of ’78 when The Sturdy Beggars were born at King Richard’s Faire – now known as The Bristol Faire. Rush joined us the following rainy summer when the mud show was born of necessity and began its development into the popular and polished yet merrily mud-spattered act it is today. Rush, Herb and John had a great crowd that Sunday – and put on a fine and funny show in the filth. Herb’s devil-may-care performance of the celebrated “Acapulco Cliff Dive” was a highlight, as were Rush’s antics as The Judge and John’s comic command of the crowd. 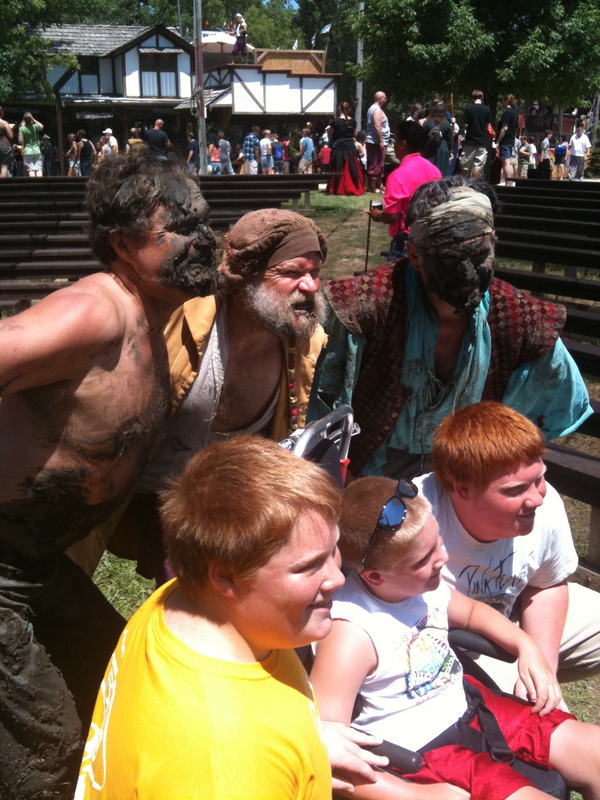 A fine summer day at the Renn Faire, a beer in hand, and the Sturdy Beggars in the mud pit make for an outstanding entertainment trifecta. Plus, we got to spend time backstage with Rush’s girlfriend, Theresa Miele. 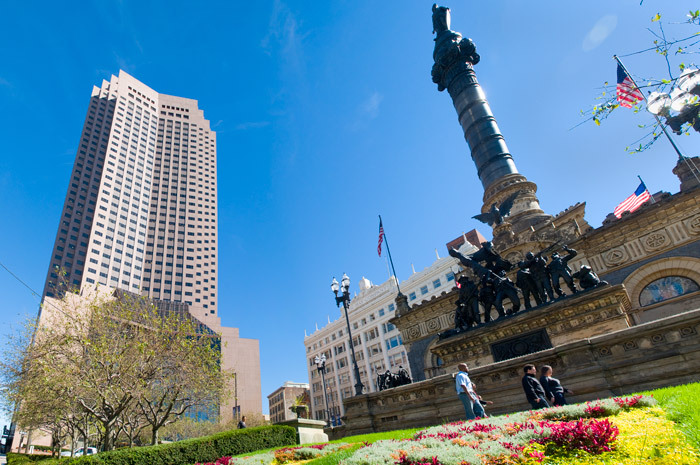 We got to Cleveland in late afternoon and checked into our downtown hotel on Euclid Avenue in the heart of Playhouse Square – just a couple short blocks from the 14th Street Theatre. Downtown Cleveland gave an immediate impression of cleanliness and civic pride, which my wife and daughter picked up on immediately. 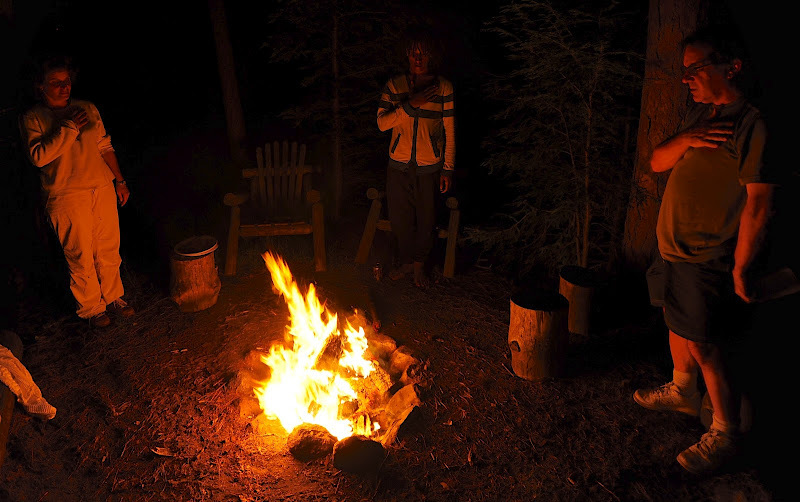 This was not the “mistake on the Lake” they had heard about – or the downtrodden town that my daughter had seen savaged in a couple of infamous YouTube videos. Cleveland was looking very good from Playhouse Square. Dinner that night was at my childhood home on Cleveland’s Westside, near the Metropark Zoo. My beloved mom, Mary, had made her magical meatballs and pasta – and we all dined on the stuff that I was raised on: love, laughter and truly great tomato sauce. Then, of course, my mom kicked all our butts at Scrabble. Traditions prevail at home in Cleveland. Later that evening, we picked up daughter Eva at Cleveland Hopkins Airport after her incredible two-week adventure in Europe. (She’ll have to write her own blog post on that amazing, life-changing trip to Switzerland, France and Italy.) 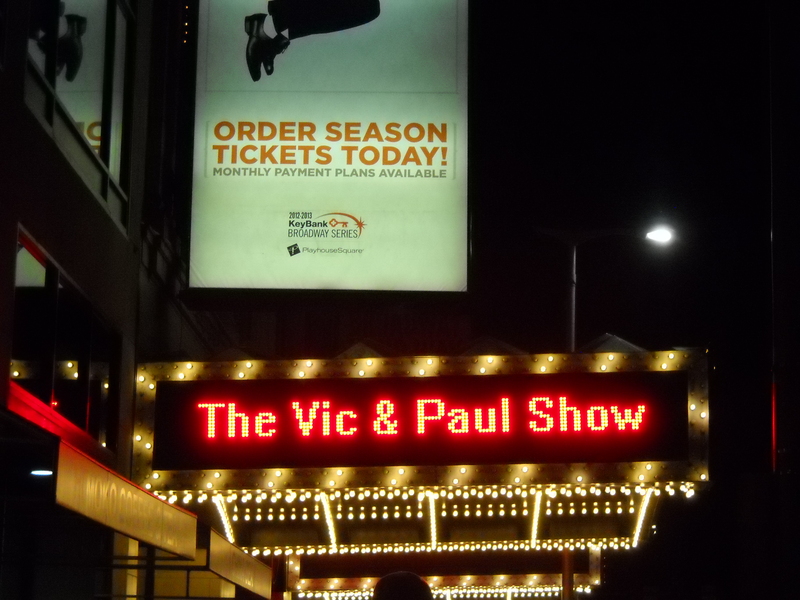 Getting back to our hotel after dark we were delighted to see “The Vic & Paul Show” announced in lights on the marquees along Playhouse Square. It was a good omen. On Tuesday morning I loaded the show’s equipment into the 14thStreet Theatre, enjoyed a late breakfast in the hotel with Vic and the girls, and then drove over to my childhood home on Cleveland’s west side, near the zoo. My daughters hadn’t been to Cleveland and Grandma’s house in way too many years, and my sabbatical provided us the chance to spend quality time in my hometown and visit my mom and family while putting on our show together. 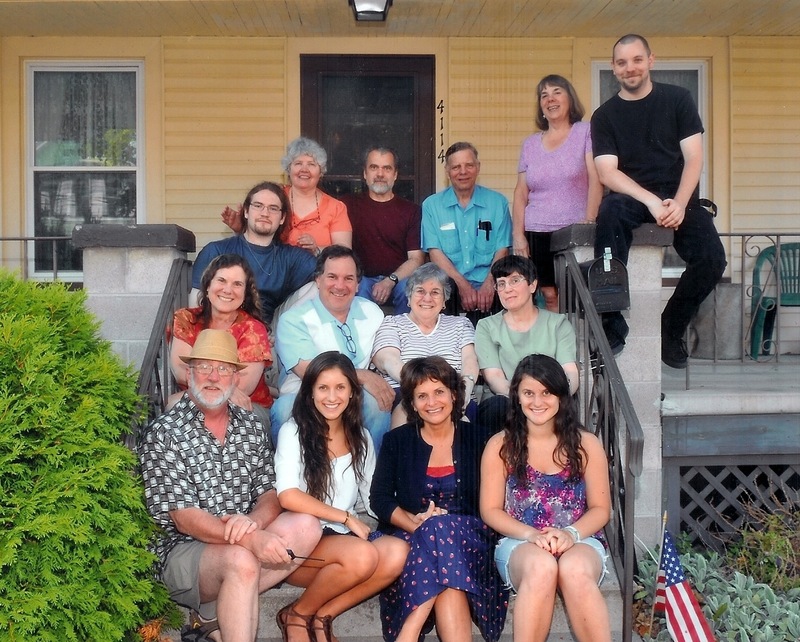 Several of my cousins joined us for a dinner of spaghetti and meatballs, some cutthroat Scrabble, and a great family photo on the front porch steps. My mom’s the lady in the middle. The photo is by Jim Metrisin, my cousin Lynna Synder’s husband, who’s sitting next to Eva, Victoria and Emilia. That’s Lynna next to me and my sister Nancy is on the other side of my mom. My sister’ son Alan Crossman is the guy in the dark shirt sitting above her. Next to Alan is my cousin Diana Snyder, my brother-in-law Alan Crossman Sr., my cousin Jim Snyder and his wife Peggy — and just below Peggy is their son Bennett. The next day, I picked up music man Steve at the airport and that afternoon we moved into the 14th Street Theatre and worked through our technical rehearsal. My daughter Emilia handled the lighting set up and her three-man union crew with competence and good humor. Daughter Eva helped out by running errands and assisting with the set-up backstage. We’re a bit like the Von Trapp Family of improvisational comedy – minus the lederhosen. 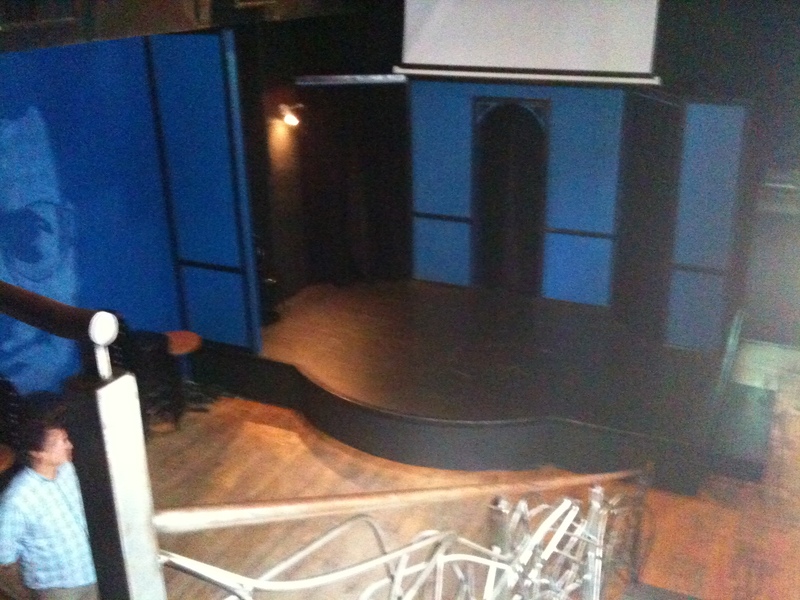 It was great to be working in a cabaret space again, designed and built a decade ago by Second City as its short-lived Cleveland outpost. Adjusting our staging to the 14th Street stage was easy, which was good because we had a few new things to rehearse. We’d made some tweaks for the Cleveland run, including a new line for Steve’s opening song in honor of the Cleveland Indians’ surprisingly competitive performance up to that point. Tonight the Tribe’s just two games out of first place! We opened the next night, Thursday, July 12th. We were fortunate to get some nice advance press, including an article in The Cleveland Plain Dealer and another in Scene Magazine (at left), which was an important rock and roll rag back in my day and has since grown into a prime source for what’s hip and happening on the weekend in the Greater Cleveland area. 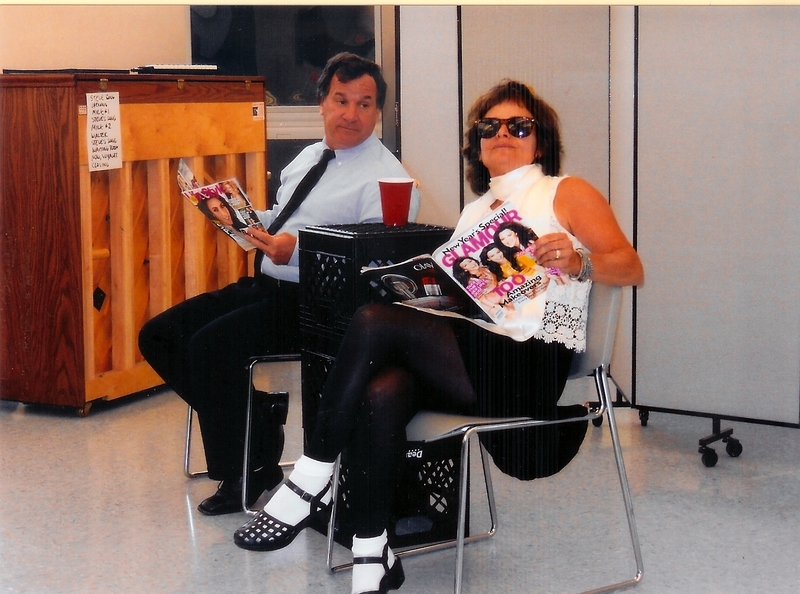 As Steve got behind the piano and kicked off the show that evening, Victoria and I waited offstage to make our entrance. I had not been on a Cleveland stage since 1976 (when I played George M. Cohan in a Bicentennial production of “George M!”) and there were a handful of cousins, former high school chums and teachers in the opening night crowd who hadn’t seen me perform since then. 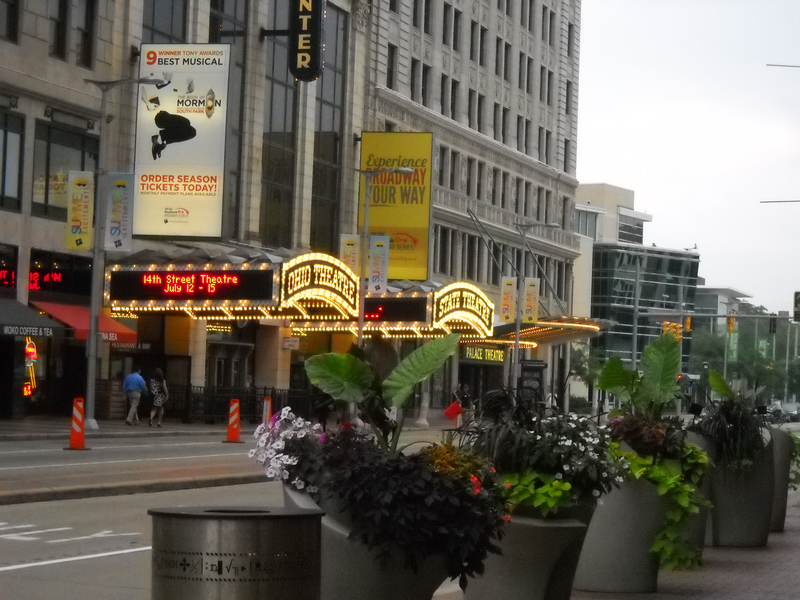 Most of the audience were strangers, attracted by the press and Playhouse Square promotional effort. How would the show play in Cleveland, especially among folks who had no idea who we were? Vic and I were reassured within moments, when Steve got a warm, appreciative laugh singing, “Tonight the Tribe’s just two games out of first place.” From there, the laughter flowed. From right: Elda Borroni (my social studies teacher,) Ellen Howard (my art teacher), her brother Jerry Fasko (my math teacher and football coach), Martha Benek (who played Marian the Librarian to my Prof. Harold Hill) and classmate Maryhelen Bednarchik and her friend John Schrader. We’re grateful they all came. Our opening night show set a pattern for the Cleveland run: great crowds, including a delightful collection of family members, longtime friends, high school classmates, my favorite high school teachers, a large and receptive contingent of perfect strangers — and lots of boisterous, knowing laughter. The only frustration was that there was not enough time to spend with all of the special people who came. A Northwestern classmate, Ellen Hyman Jones, drove all the way out from New York to see the show! There was barely enough time to dash out to the lobby and greet as many folks as possible before we had to clear the theatre, straighten backstage, and get our union crew off the clock. Friday was a very busy day. We began at 1:00 PM by putting on a free show at the senior center where my mom volunteers — Senior Citizen Resources near Broadview and Pearl Road. As we set up for the show we had our concerns that many in the audience might be too old or too hard of hearing to get all the jokes – but we needn’t have been concerned. 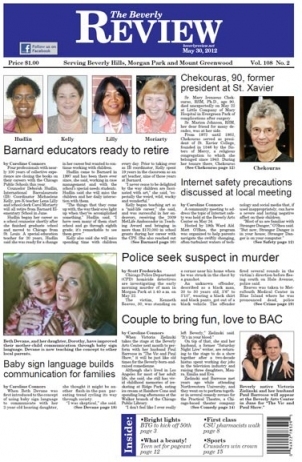 That roomful of seniors turned out to be one of the most engaged and appreciative audiences we’d ever entertained. There was no joke too subtle (or too racy) for this crowd. My mom sat at the center table with her fellow Red Hat Ladies and my sister, Nancy. A good time was had by all — especially us. Then it was on to the West Side Market. I was eager to show off the market to Steve, Emilia and Eva. (Vic had seen it before.) 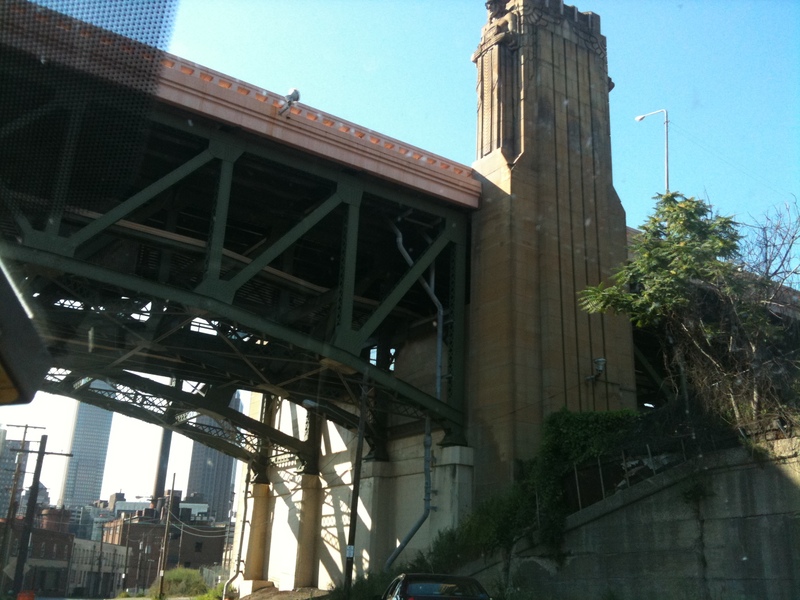 It’s been a Cleveland landmark on West 25th Street since 1912. 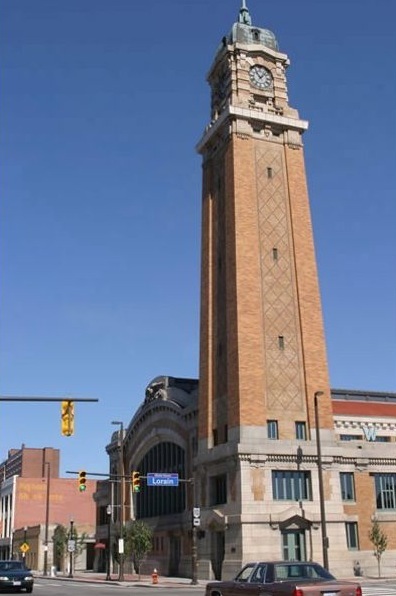 Unknown to me, the West Side Market was, of course, celebrating its centennial – and there was a festive buzz in the air. Here are Emilia and Eva enjoying the view from a balcony high above the crowded stalls filled with meats, cheeses, bakery, and other fabulous ethnic foodstuffs. Next, we drove to the east side of Cleveland to meet with my high school art teacher and mentor, Ellen Howard (Ellen Fasko back in my day), for a quick tour of my high school. Or at least one of the campuses I attended. We didn’t have a football field when I went to CCC. In my day, Cleveland Central Catholic was a one-of-a-kind educational institution. In 1969, four struggling Catholic high schools – two on the west side (St. Michaels and St. John Cantius) and two on the east side (Our Lady of Lourdes and St. Stanislaus – joined together in a unique scholastic experiment. My brother Peter was in that first CCC class. Three years later I enrolled as a freshman. 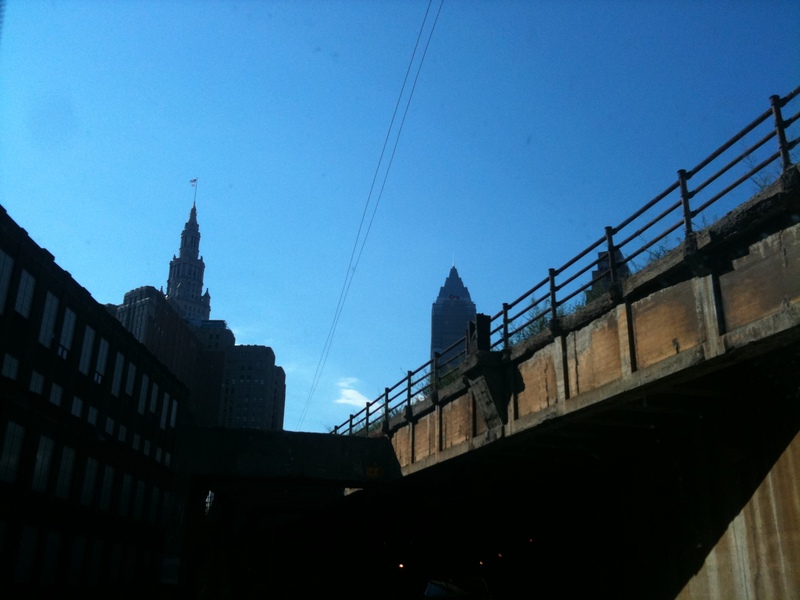 By my junior year I was driving crosstown to classes on both sides of the Cuyahoga River Valley, known in Cleveland as The Flats. 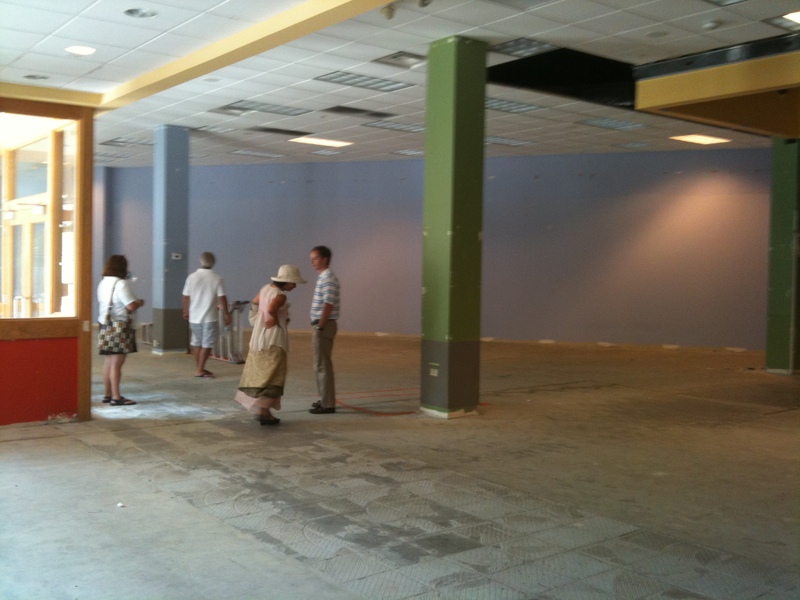 Today, only one campus remains: St. Stan’s — the one we toured. Ellen showed Vic, Steve and the girls the building where my football locker room was (and still is), as well as the classrooms where I took art class and history. We also pored over the 1976 yearbook from my senior year that I’d worked on, writing copy and photo captions. 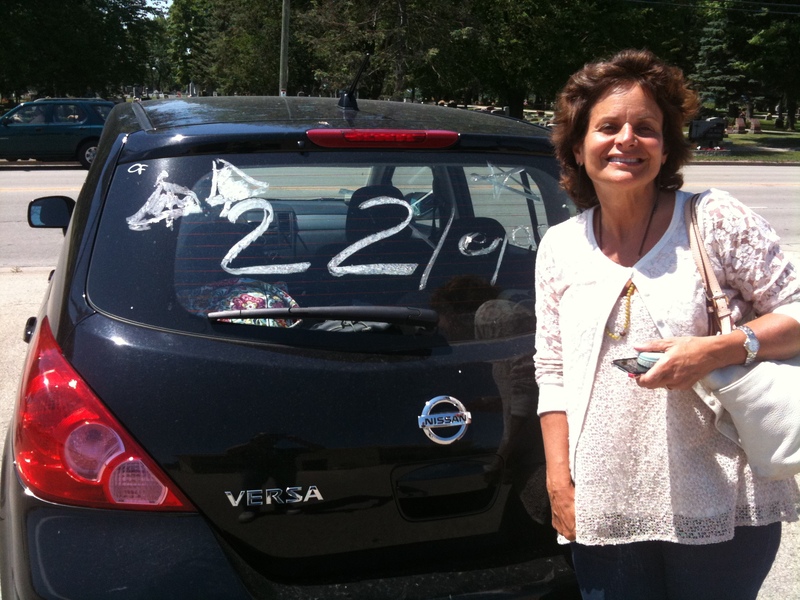 Ellen was our yearbook advisor – and remains a Central Catholic treasure to this day. 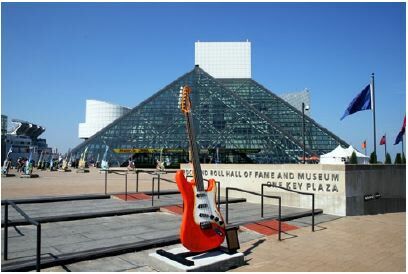 During our stay in Cleveland we also squeezed in a visit to the Rock & Roll Hall of Fame, less than a mile’s walk from Playhouse Square. There was way too much to see at The Hall of Fame and we had far too little time to see it all, but it was a rewarding experience nonetheless. 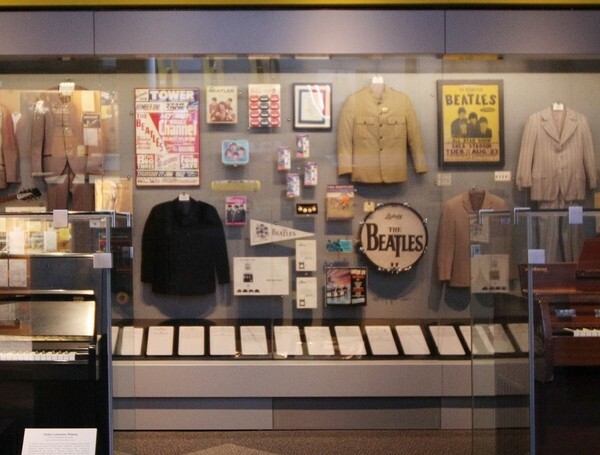 A particular highlight was sitting on the floor with my wife and daughters, all of us spellbound by a series of videos detailing the unique stories behind each of The Beatles’ wondrous albums. We could have sat there forever — but we had a show to do. 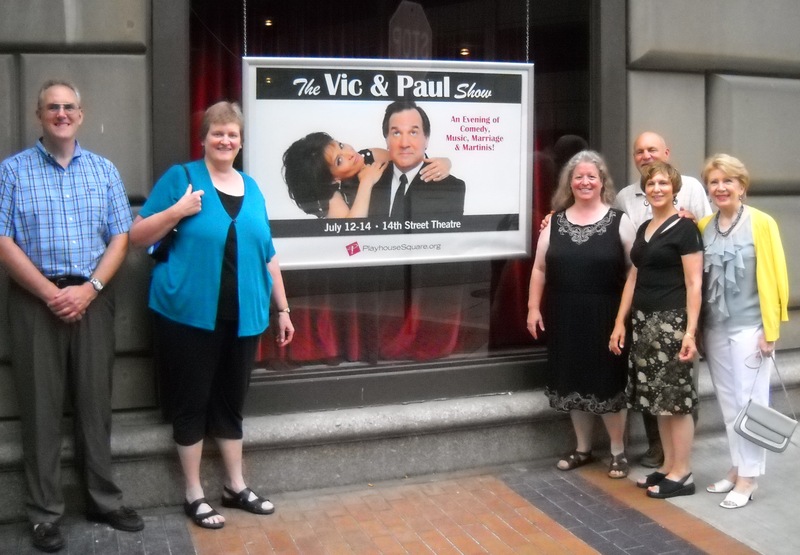 Closing night of “The Vic & Paul Show” at the 14th Street Theatre was a triumphant end to a great run. After the show (and a frantic load-out) we raced back across The Flats to the near west side for a closing night party at Sokolowski’s University Inn, a fine Polish restaurant run by former high school classmates of mine. A typical view from The Flats. Another view from The Flats. 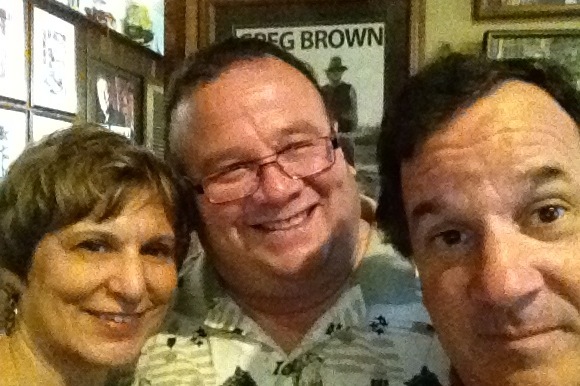 Ellen Howard, my classmate Frank Nunez & me. A special group of my favorite former high school teachers, coaches, classmates and family were waiting at Sokolowski’s to celebrate with us. It was a magical end to a wonderful Cleveland homecoming: a memorable party full of friendship, laughter, great old stories, good wine — and several plates piled high with pierogi! Cleveland knows how to party. This Cleveland stage of my summer sabbatical was particularly important. After two decades of making television shows that entertained a remote audience whose response to my work I could only imagine – taking “The Vic & Paul Show” to Cleveland was an opportunity to reconnect with live audiences in a town far away from Hollywood and many miles removed from Chicago, where The Practical Theatre Company made some history and earned a reputation that lingers today. Making salt of the Earth Clevelanders laugh was a professional victory for us all — and a deeply personal honor for this author. If I did nothing else during my summer sabbatical, our adventure in The Best Location in The Nation made it all worthwhile. Next: Further cabaret explorations in Evanston and Chicago, a brief return to Cleveland, and “The Vic & Paul Show” summer tour ends on the Hollywood Walk of Fame. “The Vic & Paul Show” Summer Tour Arrives in Los Angeles, August 9-12th! 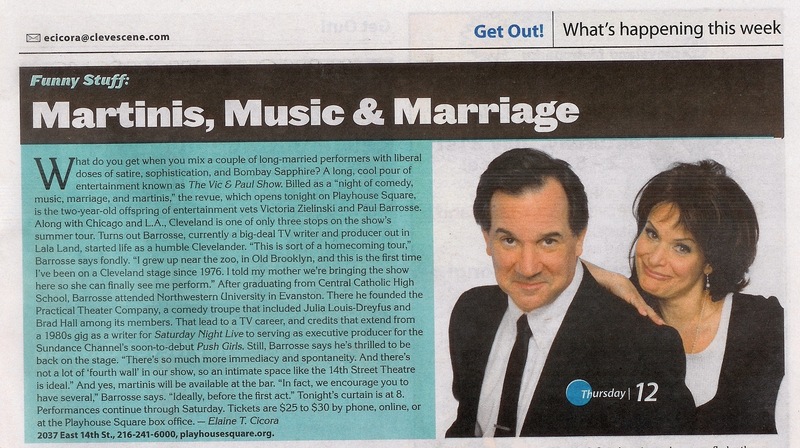 Tickets are on sale now for the final four performances of “The Vic & Paul Show” at the iO West Theatre in Hollywood. CLICK HERE. 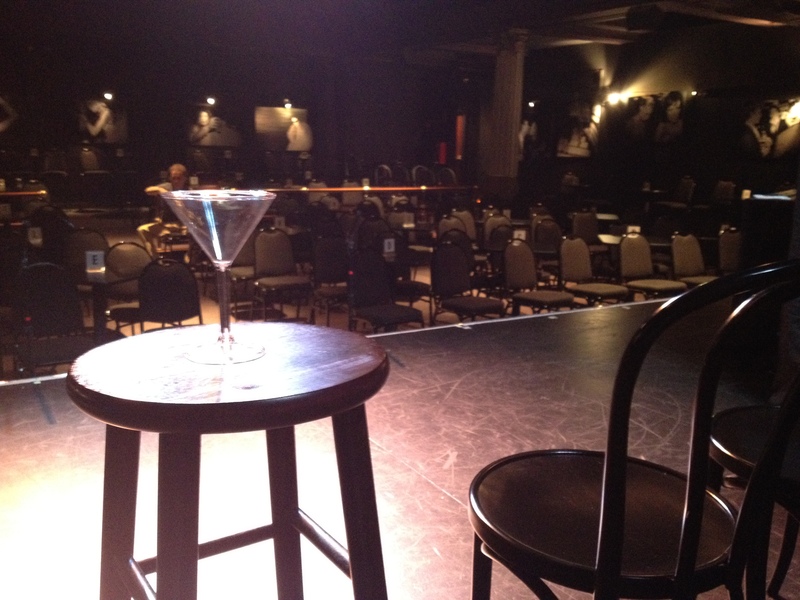 After stops in Chicago and Cleveland, “The Vic & Paul Show” Summer 2012 Tour is celebrating the conclusion of our comedy odyssey with four performances in an intimate cabaret venue on Hollywood Boulevard: The iO West Theatre. It’s the perfect place to enjoy a cool summer drink and share some groovy music and lots of laughs with Paul, Victoria and Steve. Seating is limited, so get your tickets now. You can do so by calling the iO West Box Office at 323-962-7560 or by going to the iO West website at http://ioimprov.com/west/io/shows/the-vic-and-paul-show. We hope to see you in Hollywood, August 9-12th, for a festive end to our great comic adventure!